On August 9th I will attempt to swim the entire length of Bear Lake as a little fundraiser for No More Homeless Pets of Utah. ( http://www.utahpets.org/nmhcms/ ). The swim is 19 or 20 miles depending on the water level. It’s not a race and I will swim it solo except for a support boat. Actually the locals say the width had been done on several occasions, but no one had ever gone the length. I feel you can never train enough for something like this, but I have swam 10 miles in 5 hours for at least one day per week for the past two months in addition to literally hundreds of bulk miles. Anyway you can read about it on the No More Homeless Pets web site and there are various articles on the web like http://www.utahopenwater.com/. I will start at North Shore St Park in Idaho and finish in Rendezvous Beach. I will cover all expenses for the swim myself and every penny donated will go directly No More Homeless Pets of Utah. Any donations will be greatly appreciated. I've had a few email conversations with John over the past couple weeks. Here is some history and information taken from some of those conversations. 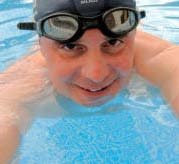 I began open water swimming over 30 years ago in the lakes of Upstate New York. It was so fun to look down and see the three dimensional world below. I remember swimming the length of my first lake when I was 12 years old. It was only about a mile but the sense of excitement for reaching the distant shore was something I will never forget. In college during the Summers, I worked in Lake George Village and swam every day at the South end of the lake. I built up to doing a 7 mile swim by the end of the first year and then swam from Tichonderoga to Dome Island which is about 24 miles the following year. This swim was 22 years ago. I got my first pool pass when I was in College. Swimming laps was very foreign to be for most of my life. Now I have made the transition and I actually like swimming in a pool. There were many of us doing long swims back then, but everyone was pretty low key so we never really knew each other. Competition seemed to go against the tranquility of swimming in such beautiful settings too. 3-that I know of it has never been done, but it's such an obvious landmark that it is only a matter of time for someone to do it. Two years ago I got a pass to a nearby pool and started swimming laps. I did one mile and then two miles and I kept on bumping up the mileage until I got to nine miles. For the past four weeks I have gone 8,9,8.9 mi on Fridays. I take this day off of work to do these distances. I have been acclimating to the cold by taking only cold showers and swimming in a pool in my yard on a tether. I began doing this when the water was 57 degrees. I would either workout on the tether or just swim around in the pool in the cold water to get used to these temperatures. It sounds painful and strange I know, but once you get used to cold water it is so invigorating and great for your health. I now can not stand hot showers- its uncomfortable.